Most young peoples’ perceptions of old age are shaped by two major influences - their grandparents and aging stigmas. That’s a narrow view of an endlessly diverse group of people. Connecting young and old is paramount to healthy aging and has the potential to change the way generations view each other for years to come. There is no denying that our society is aging rapidly. For the first time in human history, people 65 and over will outnumber children under 5. In the US, approximately 1 out of every 7 people is over the age of 65. By 2040, that number is expect to grow to 1 out of every 5 people. There's also no denying that a majority of us fall victim to aging stigmas, both in the way that we perceive others and how we perceive ourselves. If you’re over 30, you’ve most likely dreaded a milestone birthday or thought yourself too old to participate in a certain activity. As the age wave ensues, people of all ages need to rethink their perception of getting old. It’s normal to want to look or feel younger, but we must fight the urge to discount ourselves or others strictly based on age. Intergenerational relationship building is key to facilitating this mindset; it serves both sides of the age spectrum. It truly is an ageism antidote! Coordinating intergenerational programs is no small task. Students and volunteers have limited availability amongst classes and extracurriculars. Most groups of older adults also have unpredictable schedules filled with social outings, family engagements and medical appointments. That is not to mention the challenges of creating programming, hosting participants and providing transportation. Sustainable intergenerational partnerships often require drawing together a wide range of resources. For example, in York, PA, our team is part of an ongoing partnership with a local college and senior center. It is noteworthy for a key reason; it is a partnership between university education, public and private sectors. 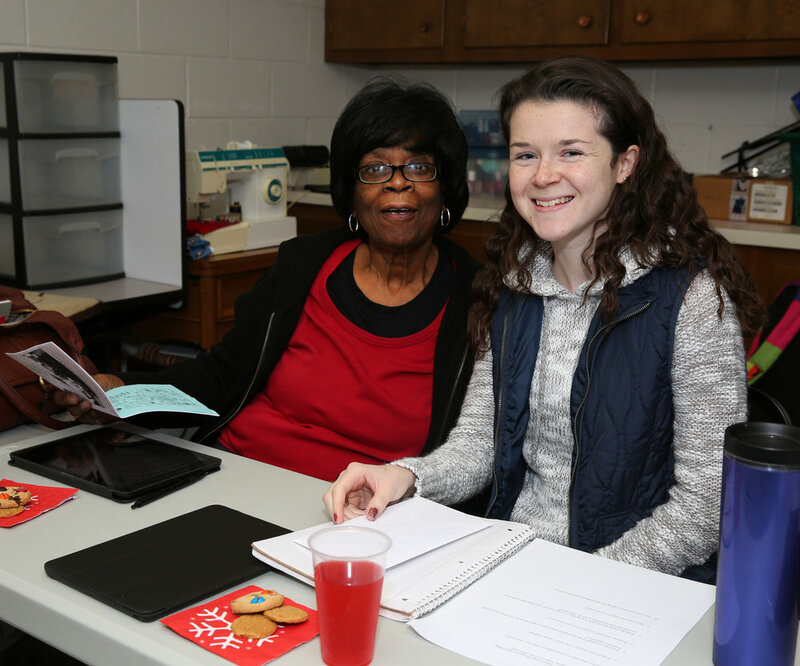 Professor Mary Ligon, Chair of Behavioral Sciences Department and Associate Professor at York College of Pennsylvania, includes intergenerational learning in course curriculum for gerontology students. 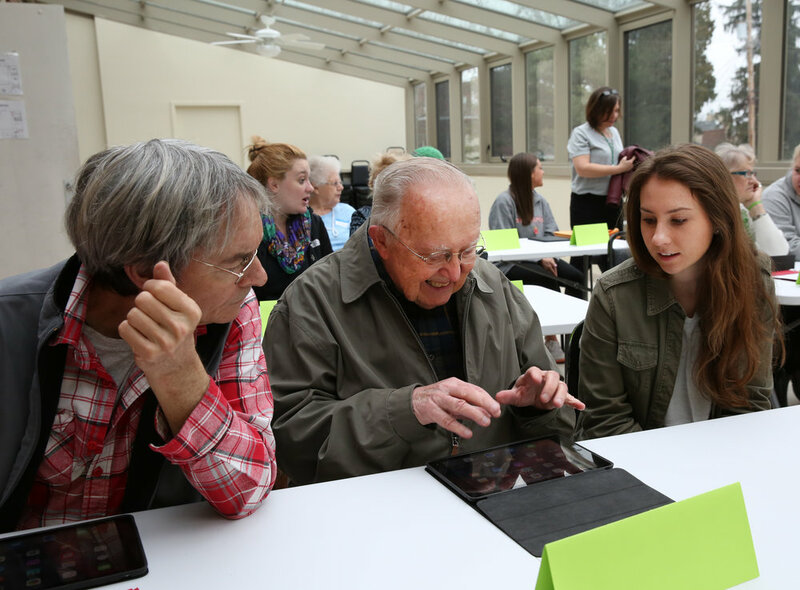 Every semester a new group of students must spend time mentoring local seniors on using technology. They are graded on individual and group communication skills. The White Rose Senior Center hosts the intergenerational training. Lisa Krout, the Senior Center manager, recruits new participants each semester, reserves a room for training and provides background information on participants to the York College students. Our team develops programming and provides devices for anyone that does not own their own smartphone or tablet. York College student discusses iPhone and iPad capabilities with a member of the White Rose Senior Center. 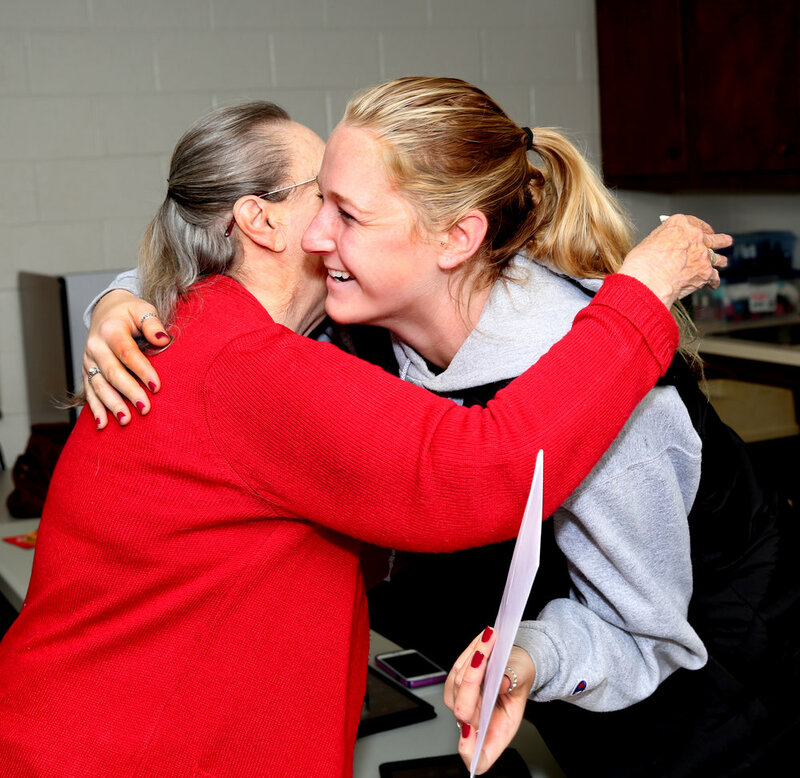 York College Student embraces her partner from the White Rose Senior Center, after recieving a thank you gift. A York College student chats with her partner prior to iPad lessons. York College student helps two White Rose Senior Center members navigate the iPad. York College student helps White Rose Senior Center member navigate the iPad. York College student chats with members of the White Rose Senior Center. Intergenerational partners smile for a picture at the White Rose Senior Center. York College student helps White Rose Senior Center member navigate the iPad. He's wearing a winter hat that was knitted by his partner. Intergenerational partners get in the holiday spirit, showing off their matching socks. Generation Connect co-founder Michael Potteiger helps White Rose Senior Center member navigate the iPad. There are obvious reasons that intergenerational relationships are important for our communities, among them students gain professional experience, references and recognition that helps contribute to becoming successful citizens. The older adults not only gain new skills through education, but they can also experience reduced anxiety, isolation and depression through socialization and a sense of purpose. The sponsor organizations benefit from testimonials, extending workforce hours through volunteers and in the best case, the volunteers can form a potential pool of vetted employees. These are the obvious benefits, but there are more abstract benefits at work. The White Rose program wrapped up with one-on-one interviews that illustrate why intergenerational programs are so important. When different groups of people work toward common goals and begin to know each other, stereotypes can be discarded more quickly. Students witness the challenges of aging, but understand that these challenges do not define the people who face them. There is a long life that's behind them, and even though they face challenges with technology, once you get to know them, it's not impossible for them to learn something new. These psycho-social benefits help reduce ageism. It seems like such an uncomfortable and misunderstood word these days. But the truth is that there are grave effects for older adults who are perceived negatively. The World Health Organization said this year that “Older people who feel they are a burden perceive their lives to be less valuable, putting them at risk of depression and social isolation.” Inspiring a young person, in even the most minute fashion, can bring meaning and value to a person’s life. Well-designed intergenerational programs contribute to healthy aging and healthy aging is an antidote for ageism, because if older adults don’t perceive themselves as fitting an ageist stereotype, chances are they won’t. Music & Memory, is a non-profit organization that that brings personalized music into the lives of the elderly or infirm through digital music technology. Julie Hyland, Music & Memory’s Director of Student Programs, is currently working with more than three dozen nursing homes that are new to Music & Memory, matching them with high school and college volunteers. Bridging Together is a Massachusetts based non-profits that develops intergenerational programming designed for students, ranging in age from pre-k to high school. More than 11,000 older adults and children have been impacted by the relationships they have formed through the Bridges program curricula. The INSLP (Inland Northwest Service-Learning Partnership) promotes leadership through university classes with key initiatives such as supporting non-profit agencies in close partnerships with universities. Students gain experience and learn to serve creating lifelong employment patterns. Join our American Society on Aging Webinar Tuesday, February 14 @ 10AM PT for Intergenerational Mentoring Success Stories; Harnessing Digital Natives as iPod & iPad Volunteers for Older Adults a discussion of the application of intergenerational programs. Michael Potteiger, founder Generation Connect, Julie Hyland Director, Wisconsin Music & Memory, Student Program and myself Debby Dodds Team Gerontologist at Generation Connect.